What will Laser Treatment of my Stretch Marks Cost? As we’ve talked about before, no two treatment plans are exactly the same. Many factors will play into what your specific treatment plan costs: how many areas you want treated, what technology has to be used, how long your treatments take and how experienced your provider is at treating stretch marks are just a few of the factors that can affect your cost. What kind of results do you get with your lasers? Let’s face it, you don’t want to pay anything for something that doesn’t work. While results are never 100% guaranteed, what amount of improvement can you reasonably expect? Can you see some before and after photos? If your provider can’t answer or show you these basic things, then it’s time to keep shopping. Training and skills matter. Especially with lasers! Celibre has provided over 75,000 laser treatments in the past five years alone. What kind of technology does the practice have? If they’ve only got one laser, then it’s a one-size-fits-all approach. If you’ve read this far, then you know that’s just not going to cut it when it comes to the laser treatment of stretch marks. What kind of experience does the practice have with stretch mark treatment? Celibre treats hundreds of new patients every year for laser removal of unwanted stretch marks. We have been providing these treatments since 2004. That adds up to a lot of happy patients! Again, we understand that cost is an important factor to you. Please don’t let it be the only one though! Real value comes with the peace of mind of knowing that you’re in completely competent, capable hands that have the skills, knowledge and tools to get the job done. Celibre Medical Corporation fits the bill. Please give us a call today to discuss how we can help you too! see the results that were achieved for other patients. 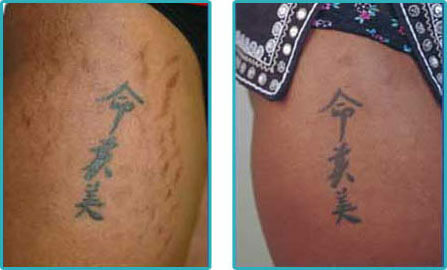 Contact Celibre today and get the best value and results from your stretch mark laser treatment!